In 2005 the Vietnamese government had a lot to celebrate: 90 percent of households were using iodized salt, and the iodine levels of women and children under 5 were in optimum range. Vietnam has historically worked hard in the fight against iodine deficiency — the leading cause for preventable brain damage in newborns and infants. The country passed its first iodine legislation in 1970 — but tweaks to their legislation had boosted progress, and in 2005 the World Health Organization pointed to Vietnam as a model for success in salt iodization. But only three years later, their progress had taken a U-turn. Results of a nationwide household survey showed coverage had fallen by almost a third — more than 30 years of progress undone in five. Today, Vietnam is officially in a backslide, Karen Codling, regional coordinator for Southeast Asia and the Pacific for the Iodine Global Network told Devex. “I can confirm that Vietnam is basically back to square one on [universal salt iodization] as a result of downgrading the program and removing mandatory legislation,” she said, adding that now only 45 percent of Vietnamese households use iodized salt. The WHO said ending iodine deficiency would be a victory on par with the elimination of smallpox. The level of impact, and the rate at which iodine deficiency has been reduced already — cases were halved in only a decade — also bears some resemblance to efforts against polio. But when we talk about the final push, or the “last mile,” these comparisons break down. Ending iodine deficiency blurs the line between disease and nutrition intervention; a distinction that is getting fuzzier as noncommunicable diseases such as obesity and cancer get more attention. The subtlety and cost effectiveness of salt iodization also masks its complexity. Donors and governments expect to fund a disease to death, then move on to something else. But with iodine deficiency, when efforts aren’t sustained, the problem comes back. 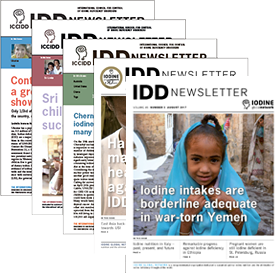 Experts from the Global Alliance for Improved Nutrition, the Iodine Global Network and others offered Devex a look at what it will take to eliminate iodine deficiency — which reduces the average IQ by 13 points in the worst-off regions — and keep it eliminated. UNICEF offers a few reasons why Vietnam’s gains against iodine deficiency didn’t last, but chief among them was faltering political will. After hitting that 90 percent target in 2005, Vietnam downgraded legislation mandating salt iodization, and efforts to monitor it took a backseat to other priorities. Concerned over further backsliding, Vietnam’s Prime Minister will consider legislation in coming days and weeks, Codling said. Getting long-term political buy-in in the face of shifting national priorities, new elected officials and a lack of resources or access to nutrition, remains a barrier to eliminating iodine deficiency worldwide, Rebecca Spohrer, associate for large-scale food fortification at GAIN told Devex. And the problem of political will extends beyond the developing world. Countries like the United Kingdom, the United States and Germany don’t have strong legislation or commitment on iodine fortification, even evidence shows many industrialized nations are still at risk. “It would be great if donor countries could lead by example,” Michael Zimmermann, chair of IGN told Devex. But political will is by nature fickle, and sustaining it even for interventions that have proven successful takes both high level advocacy and close coordination with beneficiary governments and industry, he said. In many developing countries, local producers supply a significant amount of the country’s salt. While mandatory iodization has worked with large- and medium-producers, small producers have less access to the necessary technology or lack the capacity for accurate testing and quality assurance. These “off-grid” salt producers present another hurdle in progress toward universal iodization. “This may lead to regional variations in iodine status within a country, which we don’t tend to see if we only report the national level data,” Zimmermann said. For example in West Africa, Ghana and Senegal are some of the largest exporters of the region’s salt, which is largely produced by small-scale producers who add little to no iodine, Spohrer said, in a region with some of the greatest deficiencies. Even those producers that are adding iodine are using basic methods, which don’t work as well, if at all, she said. So organizations like GAIN and IGN are trying a different route. Processed foods are increasingly a key source of salt in diets worldwide, she explained, so assessing whether the salt is iodized in these foods — usually chosen based on local and regional diets — offers an alternative strategy to reach the most vulnerable. Even with a new focus on condiments and other processed foods in regional diets, and less focus on getting smallholder producers to iodize, the business case still needs to be made to get governments and industry on board. Salt iodization, and food fortification broadly, remains the public health intervention that provides “the greatest return on investment,” Zimmermann said, echoing remarks from Bjørn Lomborg, director of the Copenhagen Consensus Center, who spoke at GAIN’s Future Fortified Summit in Arusha, Tanzania. While it is important to get the private sector on board, public money must be spent to solve a public problem like malnutrition, Bjørn Lomborg, director of the Copenhagen Consensus Center explains in this video interview. Iodization should be an easy sell for governments and industry, Zimmermann and Spohrer said. GAIN found, in cooperation with partner organizations, that iodization coverage could be expanded for as little as $0.05-$0.20 per person, at least in three countries it sampled. Elected officials and salt producers are sometimes hesitant to iodize for fear of a possible price increase -- which usually amounts to around 1 percent. When they express such concerns, Greg S. Garrett, director of food fortification at GAIN, explains how iodizing makes good business sense in the medium- to long-term. The last mile for eliminating iodine, Garrett and others agreed, benefits from a few tried and true strategies. What’s needed now is a combination of creativity from implementers and a shift — at the highest levels of donor and beneficiary governments — in understanding what it will take to eliminate the problem at the national and global levels. Future Fortified is a special online series presented by Devex, in partnership with GAIN, exploring the impact and importance of food fortification to meet global development objectives. Visit the campaign site and join the conversation using #FutureFortified.